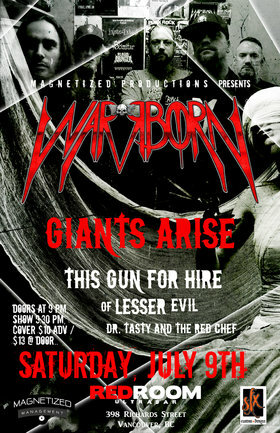 Magnetized Productions Presents: Warrborn / Giants Arise / This Gun For Hire / Of Lesser Evil and Dr. Tasty and The Red Chef. More artist TBA. Saturday, July 9th at Red Room Ultra Bar, 398 Richards Street, Vancouver, BC. Doors at 9 pm, Show 9:30 pm, Cover $10 Adv / $13 @ Door.